So, you're working on something and the phone rings, someone comes up to you and starts talking or you receive a text, email, tweet or Facebook message you want to respond to. How does Freelance Time Manager handle interruptions? How can you record accurately what you do if you keep getting interrupted? If you choose the product you're about to work on at the start, then when you are interrupted, all you need to do is press [record your work]. That records the time you've spent up until now. Now, you can give your full attention to your colleague or client. .. and you are all set for the next interruption. So remember, when you [record your work] and the screen refreshes, always choose the next product you're about to work on. That way, you're ready for the next interruption. The rest of this article is me yarbling about more esoteric nonsense so if you want to skip back to Freelance Time Manager now, feel free. This 'handling interruptions' thing is so easy to do, I've found myself recording much more accurately the time I spend on Facebook. I tend to nip off for a second pretty much anytime I'm going to wait for the computer for a moment. For instance, I might set up a website backup that I know will take a minute or so .. I'm off to Facebook. 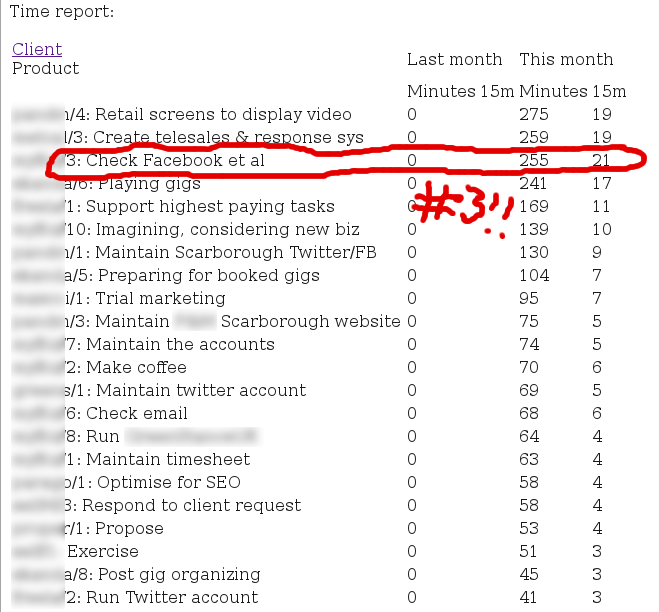 Registering interruptions is so easy, and the reward (knowing exactly how much time I spend on Facebook) is genuinely motivating, that I'm logging those moments in Freelance Time Manager. Turns out I spend quite a bit of time on Facebook, it's my third most time consuming single thing! Previously, my system involved using a time management system that is the last software I'm running on an old Windows machine (I use Linux as my main system). So I have a notebook (actually an artists sketchpad, I have these back to 2000), and I write my times in there. Then maybe twice a week I crank up that Windows machine, sit at the cheap seat and sit and enter those times into that old time management system. 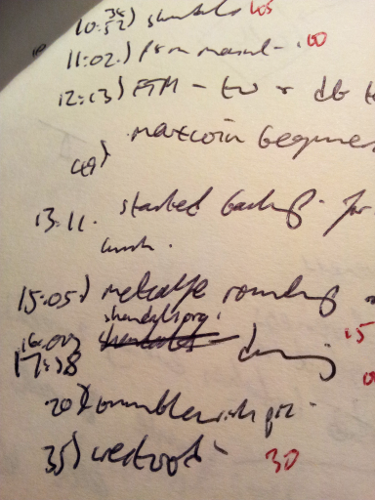 The red notes in the pic are me working out the 15 minute thresholds so I can enter them. Nonsense, right? But I've tried to find a better system and failed, which is why I decided to build my own. Remember, too, that the Freelance Time Manager formats well on your smartphone or tablet, so you can use it anywhere there's a web connection (and I've worked out a way for it to work even if you can't get a signal .. but .. that'll need programming). Anyway, back to Freelance Time Manager.